lotus sign on my palm???? please help me , I think there is a sign of lotus between my mercury and appolo finger ,its not that clearly visible . lotus mark is just above my heart line . the base of lotus is touching my heart line slightly . Re: lotus sign on my palm???? 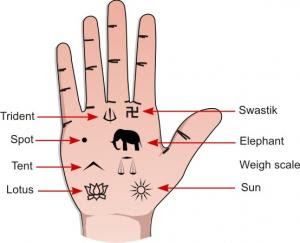 In Indian Palmistry you will find Lotus Sign etc. I can only see that your Sun Line just above the heart line and the fate line from a little below the heart line are both prominent, so success and happiness in old age. siddartha.siddu wrote: please help me , I think there is a sign of lotus between my mercury and appolo finger ,its not that clearly visible . lotus mark is just above my heart line . the base of lotus is touching my heart line slightly . See between flag sign annd sun line . U can see it clearly in the 3 rd image , in my above post. I neither believe in Flag/Lotus etc. etc. nor do I follow it. You may not find its mention in any Western Palmistry Books. siddartha.siddu wrote: See between flag sign annd sun line . U can see it clearly in the 3 rd image , in my above post. pravin kumar wrote: I neither believe in Flag/Lotus etc. etc. nor do I follow it. You may not find its mention in any Western Palmistry Books. I agree with pravin kumar regarding the flag/lotus, etc. ; actually, I think most theories about 'signs' are build on speculative grounds. Theories about 'signs' represent the core of classic superstitious palmistry, where so-called 'signs' have been described that do not really exist (some examples are displayed in the picture below). NOTICE: Most of these signs likely do not really exist. In a way one can even understand this to represent a cultural phenomenon. For example: in many countries (such as: India & Pakistan) young children usually do not learn how to swim well, and as a result it is hardly surprising that many children will have fearful/negative experiences with water... which kind of explains why the theory about a so-called 'fish' in the mount of moon became a popular issue in classic palmistry. But the truth is that there is not widely shared agreement regarding how to recognize a fish exactly, and therefore hand readers sometimes tend to make associations regarding signs... even though such signs may not really exits, because they can be recognized to represent a myth. Thank you for posting your request. Unfortunately, I don't think that there is a lotus sign inside your hand; I think this is kind of like seeing a sheep inside the clowds ... sometimes one can see a lot of things in a bunch of unclear lines, but every person will see different things and the associations may even vary with how the light falls on the palm! It's just a matter of (subjective) psychology & selective perceptions, see my previous post - which e.g. includes an example of a so-called 'lotus' sign - even though it may not really exist at all, some people may still 'believe' to have seen such a sign. I hope this is useful?. I agree that most signs may not exist. The common ones which do exist are the lotus, fish, flag and trident. This may be just a speculative theory at the moment, but nothing can be concluded. The human mind itself works on psychology. The basis of psychology is Imagination. Again, not all imagination is unhealthy. Imaginations which may work for some may not work for others. Coming back to signs.... SIGNS are actually symbols which are embedded in our sub- conscious minds. In fact sounds and symbols make the sub-conscious mind. They are converted into words in our Conscious minds. The lines on the palms are nothing but the impressions of the mind of each person in an active or attenuated state in this particular life. Palms contain, dermatoglyphics, lines (straight or curved ), dots, circles , grilles, crosses, stars, triangles and squares which are again formed from lines. Signs are formed with these very basic shapes, for example, a Flag is formed by a line and a triangle. Similarly, other signs are formed with these basic shapes too. Logically, if the mind is responsible for the lines on palms, why not the signs on the whole ? If a flag is accidental or based on imagination, then even lines, triangles , stars are imagination and psychology which is widely accepted by our Western palmists. There may be millions who think palmistry to be rubbish and nonsense, but to our psychology it does not seem so. By this theory, our very existence is our psychology which is illusory as conveyed by the experts in metaphysics. But this very illusion is working for us right now , which may prove to be contrary in future. Even the past, present and future is our imagination which our individual minds contain at this moment. But can it be proved ? We have just heard about this from saints and adepts. Its unto each person to believe or not . I have not reached any conclusions about such signs which I have on my hands too. I will wait for the time where it is marked on my hand. When it comes to intuition, I am a skeptic too ! I do not believe until my power of reasoning gives a green signal. But there are certain phenomena which are beyond the understanding of the Intellect ( this paradox is true ). I only want to ask the readers, think things for yourself , one should not blindly agree to anybody before you have confirmed it yourself. Symbols and archetypes are part of Tarot, Astrology (all schools ), I ching, Runes, then why not Palmistry ? Is Palmistry a copyright or property of the FBI ? Every SIGN has a specific meaning, and the same ideas should work in palmistry, now this is MY PSYCHOLOGY, believe it or not ! !